A Jazz band marches with white caps, black visors and red sashes flooding the street with soulful music. Feathers fly from dancing, twirling umbrellas held by Women adorned in black. The scene suggests a funeral procession… or is it a celebration? The date of December 21st of 2012 is believed by some to mark the end of the world. In Eureka Springs, the date marks the beginning of a new tradition. 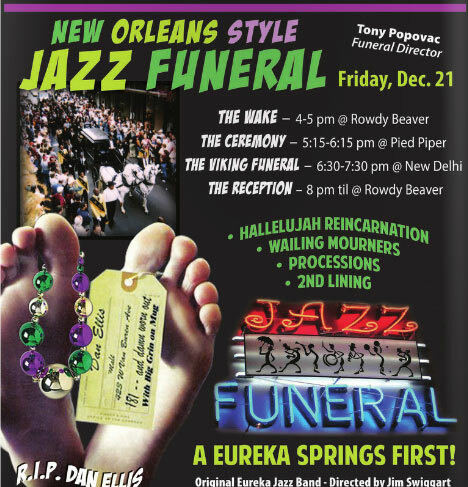 The First Annual Eureka Springs Jazz Funeral is your opportunity to CELEBRATE LIFE with Eureka Springs locals at an authentic New Orleans style Jazz Funeral. If you have attended Eureka Springs Mardi Gras then you know Eureka Springs loves to party and parade. New Orleans transplant, Dan Ellis, plans to enjoy one of the biggest parties of his life….his funeral. Party at The Wake, walk with The Procession, wail at The Ceremony, say farewell at The Viking Funeral, mingle at the Reception and rejoice at The Hallelujah Reincarnation! A typical jazz funeral begins with a processional march of family and friends, joined by a brass band from the home or church – to the cemetery. Throughout the march, the band plays somber dirges and hymns. After the burial, a change in the tenor of the ceremony takes place. The music becomes more upbeat. Raucous music is accompanied by cathartic dancing while onlookers join in to celebrate the life of the deceased. Those who follow the band just to enjoy the music are called the “second line” and their style of dancing, in which they walk and sometimes twirl a parasol or handkerchief in the air, is also called the “second line”. If you have never had a chance to participate in or observe a New Orleans style Jazz Funeral before, this is your chance. Join the 2nd line and celebrate being alive in one of the most FUN places….Eureka Springs, Arkansas. Be one of the original participates in the first Eureka Springs Jazz Funeral. Make plans to visit Eureka Springs for this new Eureka Springs Tradition. See vacation deals on ReserveEureka.com. Find Lodging in Eureka Springs. Learn more about the Jazz Funeral. Sign up to be a mourner. 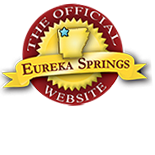 Visit the Official Eureka Springs Calendar of Events. This entry was posted on November 28, 2012 by estcblog in Arts & Culture, Attractions, Festivals, Fun Downtown, History, Musical Adventures, Things to Do and tagged Arkansas, downtown, Eureka Springs, historic downtown, history, local culture.